Bounding Box Games Dev Blog: Indies on XBoxOne : The questions remain. I'm still seeing mixed reports about what will actually be required to publish games on XB1. Matt Booty, the general manager of MS's Redmond Game Studio, has told the media that publishers will be required, while Don Mattrick has said they were planning to support developers of all sizes. I don't understand why Matt Booty's comments seem to be carrying more weight in the media than Don Mattrick's, considering who is actually in charge of the XB1. Don Mattrick: "We're going to have an independent creator program... There's no way we're going to build a box that doesn't support that.". Seems pretty clear to me, and he's in charge, so why are we hearing others say a publisher is going to be required? I wish the MS crew had a consistent message, the opportunity cost of this mixed message is getting bigger every day by not making it possible for indie devs such as myself to plan. I'm hoping the //build conference next week will set things straight; it would be a logical place to bring out the official message and I'll be holding my judgement until then. Microsoft is obviously huge, and it would be no surprise if not everyone knew exactly what the final, official plans and requirements are going to be until it's made clear in that kind of forum. It could very well be that things will turn out better than what indie devs are fearing right now. Then again, it might turn out that MS just wants to put out the AAA games and call it good. Of course, players wouldn't call that good, but that's another issue. Another possibility is that plans are in flux and the MS execs are still sorting things out. The type of press XB1 has had since E3 is almost certainly the center of some serious conversations at MS HQ. It's entirely possible their plan all along was to give out as little info as possible for the express purpose of being able to change plans based on the public reactions without losing face in the process. Personally I'm ok with a little corporate backpedalling if it means the customers get what they want. As far as the publishing requirement goes, if it does turn out to be part of the plan I won't fault MS for not wanting to spawn another marketplace of fart apps, online vibrators charading as games and barely reskinned tutorials. It's no fun seeing my serious efforts, the result of literally years of work, sitting next to that sort of thing in the marketplace either. If getting on XB1 meant establishing some kind of low-commitment relationship with a publisher in order to maintain some reasonable level of quality in the marketplace I can see that actually being a good thing, despite the hive rage brewing in the indie scene right now about needing a publisher. I have heard of far too many people who avoid XBLIG because of the perceived lack of quality games to be found there, and there is some truth in that. Keeping expectations of quality high is a good thing for keeping people interested. Right now I plan to stick with XBLIG on XBox 360 for a while and let things settle down a bit, and then aim for whichever console seems to make the most business sense. If that means a publisher to get on XB1, I'm OK with that, assuming any would take me and it wasn't a lopsided deal. Who knows, maybe it could mean money for artists which is a real bottleneck for me at this point. It's always been my goal to turn this business into a small group of people anyway, maybe that would be part of making that happen. I'm going to keep my options open, and right now I think that means holding tight and doing my best to make Thunder Moon the best game I can. 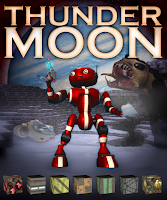 Speaking of Thunder Moon, the work on multiplayer will be starting soon. I'm happy to be able to tell you that it's climbing the charts and the daily conversion rate has risen to over 45% which suggests to me players are looking for the game and not just stumbling onto it. This is a good sign, and hopefully the trend continues. Thanks everyone for your support!